R. Paul Stevens uses this book to step back from common assumptions about Christian life and re-assess how all of God’s people contribute value to his kingdom. Stevens’ major argument is that there should be no high separation between clergy and laity within the church. To clarify: he recognizes different gifts and roles, and by all means the pastor should be the pastor and the janitor should be the janitor; but before God they are qualitatively the same, rather than one being an ‘ordained position’ that God can really use, and the other a lay position that’s only out there so that the ordained guy can do what really matters. Stevens treats this topic quite extensively. He examines the scriptures and finds no support for distiction between layity and clery within the new testament, and thoughtfully considers the implications of the old testament structures for the new testament. He then looks at different points within the early Fathers and subsequent church history and analyses how a distinction of clergy developed; his obvious implication is that it shouldn’t have. Stevens spends a fair amount of thought on a person’s calling and ordination. There is much that would be valuable for the church to consider here. A sampling of thoughts: * If we ordain people that live out their Christian work as pastors, let us also ordain people that live out their Christian work in other roles: let us ordain the salesperson to be a salesperson to the glory of God as he ethically promotes commerce, the painter be a painter to the glory of God as he explores meaning and creates beauty, the farmer, the manager, the home maker … * The call to be a pastor is typically not a mystical experience; the Damascus road experience of Paul was the exception, not the norm. Rather, the normative call to a leadership role in a church in the New Testament was from “the church” itself (Stevens doesn’t delve into considering Presbyterian vs. Episcopal governance). Why do we not still do this, and train those so called by the church, rather than youth go off to seminary based on their own whim before they are even mature enough for military service? Stevens never outlines his underlying worldview, but you can pick some of it up from clues as you read. He doesn’t give enough clues to pick up his denomination (though what he says clearly rules several out). His views include those… * fairly consensual among the church (e.g., covenant theology), to others * immaterial to the topic (e.g., he never discusses it, but one chart implies he is a pre-millenialist), to others * controversial (e.g., that the church should be no distinction between men and women, in the process stating — without providing any rationale — that Junia was an apostle. Thankfully, in the news as I write this review, it is in the news that Joseph Cardinal Ratzinger is defending us from that one with an encyclical!) As the book nears the end, Stevens introduces lots of ideas around living out life in the world. This scattering of ideas is presented without a uniting framework, and the ideas themselves are not fully developed within the text. The topics he addresses are reasonably abstact — there are certainly no simplistic “7-steps-to-such-and-such” that curse much popular writing. As typical treatment of a topic, he describes options for approach to political involvement, ranging from Anabaptist to Theology of Liberation, in a couple pages; elsewhere he provides out-of-the-blue a quote about “red, green, and white martyrdom” from “the medieval celtic church” with no surrounding evaluative comments. Some of the many ideas throughout the book I found through provoking, and others off the wall. This is a good book to read if the reader to come at it with a “testing the spirits” attitude. After the well-worked-out treatment of the topic of clergy / layity non-separation, Stevens’ ideas are quickly introduced without rigourous thought. I found some of the biblical citations that he uses are invalid – read in context, they don’t actually support the point he is making. (But then, that’s too common a fault in most treatises!) Use this as an opportunity to initiate thoughts down new paths where the idea warrants it, under guidance of scripture and prayer. This is I think in fact Stevens’ intention: the book is not intended to fully answer every questions, but rather contains case studies and probing questions of its own (at the end of each chapter) to stimulate the reader to think further for himself — or herself, as Stevens would be certain to complete the phrase. Paperback: 300 pages. Publisher: Wm. 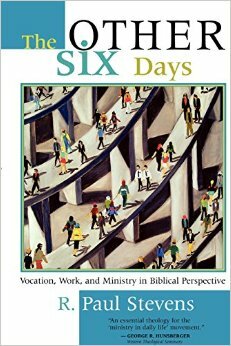 B. Eerdmans Publishing Company (July 5, 2000). ISBN-10: 0802848001. Price: $24.30.